Along with being raised in a loving home, two pivotal events in Elder Lyndon Whitney Clayton’s life have made all the difference, he says. One was serving as a missionary in Peru. The second was marrying his wife, Kathy Ann Kipp, on August 3, 1973, in the Salt Lake Temple. They are parents of seven children. “Our children joke that time at home with Mother and Dad often turns into spontaneous family firesides,” says Elder Clayton. “And that is a fairly accurate description.” The Clayton family loves to sit and discuss a wide variety of subjects; they also love to sing together. Elder Clayton was born in Salt Lake City, Utah, USA, on February 24, 1950, to L. Whitney Clayton Jr. and Elizabeth Touchstone Clayton. 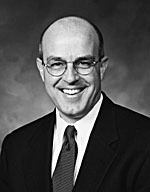 He grew up in Whittier, California, USA, received a bachelor’s degree in finance from the University of Utah and a law degree from the University of the Pacific in California.